Want Me To Read Your Email? Pay Me. Everybody hates their email inbox. I’ve begged entrepreneurs to fix the problem. So far, nothing. A new service called Attention Auction isn’t going to fix that problem, either. But it’s a start. People bid to get you to read their email. 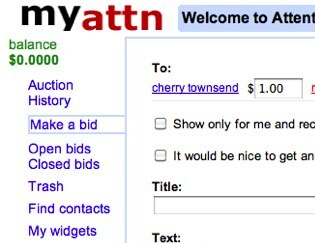 You find someone you want to contact, see how many other messages are in their inbox and how they are priced, and then bid for your message to get in the line. If your message isn’t read you can increase the price and push it higher in the queue. As a recipient you’ll see messages sorted from the highest price to the lowest. Open the message and get paid. Stuff like this can turn opening your inbox from a nightmare into a way to pay for the morning Starbucks. And it isn’t just for people that get a lot of inbound attention. It’s also a way for advertisers to reach people in a non-spammy way. Particularly if profile information is available to help target those ads so they’re not completely useless. Yes, this type of thing has been tried before, most famously by AllAdvantage in 1999, which paid users to view ads online. Ether lets people charge for phone calls, but hasn’t really gotten much traction. Attention Auction probably won’t do any better than they did in the end. The site is buggy and only works some of the time, which doesn’t exactly build a lot of trust. But I like the idea, particularly if it was integrated directly into Gmail and other webmail products. So how about it, Google? Why not let people pay me to read their email? You can even take a cut of it for yourself. Or maybe AOL will give it a try, they say they’re going to be doing some interesting new things with email.